Scooper - Technology News: Why is America not improving its business regulation? Why is America not improving its business regulation? So much for being the nerve-center of global capitalism. The United States is the only country with significant state capacity that has not improved its business regulations over the past dozen years, as seen in the World Bank’s Doing Business 2017 report . In fact, the country shares some awkward company in the ranks of non-reformers – including Bolivia, Iraq and Eritrea. Now, the US economy is obviously a much better place to do business than these states, but its stasis on reform efforts is nonetheless striking compared to wealthier peers. This may be due to federalism or to partisan politics in Washington DC, though neither are convincing explanations. Whatever the reason, policy stagnation helps explain America’s loss of competitiveness relative to other economies. Since 2005, the United States has fallen in the World Bank’s Doing Business ranking, released today, from second behind only New Zealand to 8th behind Singapore, New Zealand, Denmark, Korea, Hong Kong (China) and the United Kingdom, among 189 countries studied. 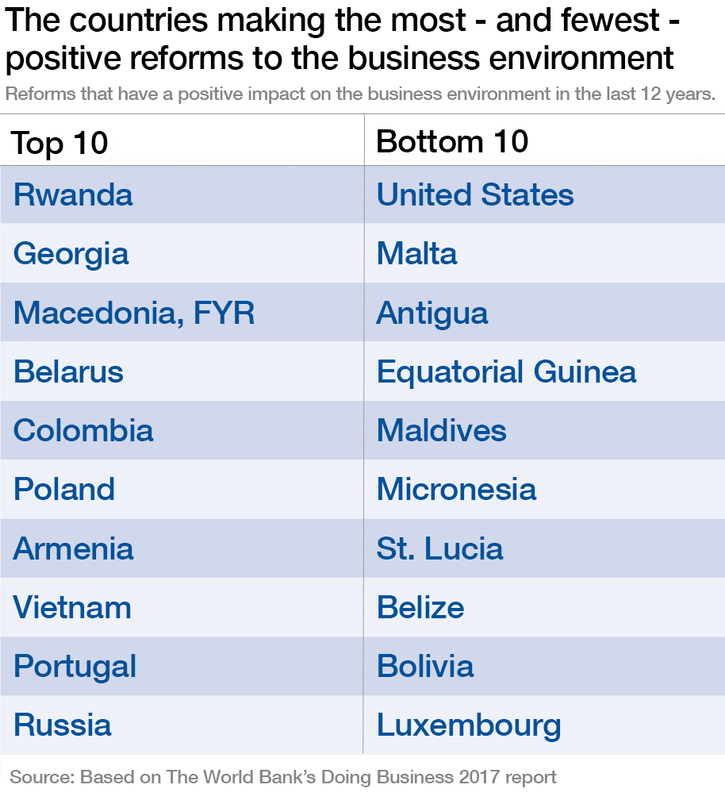 Every year the World Bank ranks the top reformers – countries that have done the largest number of positive changes to the business environment. These statistics can be aggregated over a dozen years to create a list of the top 20 and bottom 20 reformers. Top reformers like Poland and Vietnam undertake nearly four reforms a year. The least-reforming economies like the United States and Iraq pursue fewer than one reform every three years. A benign explanation could be that the United States is simply such a hospitable place to do business that there is little need for improvement – and improvements are mostly needed in countries that play catch-up with more competitive economies. Indeed, 17 of the top-20 reformers are former communist countries. Such countries had to make tremendous changes to their laws and regulations to move from central planning to market economies. Not surprising then that they will be among the fastest reformers. Rwanda, Portugal and Mauritius are the three economies in the top-20 reform list without a communist past. Each, however, has a compelling story on the urgency of business reforms. In the first instance, this urgency is the result of a consistent reform effort by President Paul Kagame’s government to develop Rwanda as a middle-income country by 2020. Portugal started rapidly improving its business environment only after the Eurozone crisis, when unemployment soared and young people started leaving the country in droves. Greece, Spain and Italy have also woken up to the need to cut red tape, suggesting that the Eurozone crisis had a wake-up effect on their previously complacent governments. Mauritius started its reform programme after the phasing-out of the WTO multi-fiber agreement in 2005, which resulted in the loss of competitiveness of its largest export industry (textiles) to China and other Asian countries. On the list of laggards there is only one surprise: the United States. The other least reforming countries are 15 small states, mostly island nations, and four failed states (Eritrea, Iraq, Libya and South Sudan). It is easy to explain the lack of improvements in the business environment in these two groups: lack of state capacity. It is much harder to rationalize the US failure to improve its business regulation. American business is supposed to be free of cumbersome government regulation. The World Bank data show that in the past dozen years the United States has increasingly deviated from this ideal. Federalism might be viewed as a potential culprit for the failure to reform: large and sprawling multi-level governments may have a tougher time keeping regulation in check. This may explain why other federal states like Indonesia and Brazil also have significant red tape. Indonesia is rated 109th and Brazil 116th on the ease of doing business. Yet, India and Russia, also large federal countries, are among the top reformers, with at least two improvements in the business environment annually. Russia ranks 51st, still significantly behind the United States, but rapidly gaining ground. Five years ago, it was not among the top-100. Federalism, in other words, is hardly the main reason for the US’s lack of reforms. Another explanation could be a two-party system in the United States that frequently creates blockage if the President and the majority on Capitol Hill are from opposing parties, as has been the case in much of President Obama’s tenure. Other federal states have the luxury of presidents pushing through legislation with the support of friendly parliaments. Mexico is a case in point. Under President Nieto the country climbed up the competitiveness rankings to reach 38th place. The Congress was firmly behind the reform agenda. Some reforms indeed depend on the will of Congress, for example the reform on paying taxes, where the United States currently ranks 53rd in the world, just ahead of Greece and Portugal among OECD countries. But others do not require major legislative initiatives, and can be taken up at the state level; for example, the regulations on starting a new business, where the United States ranks 49th, behind Morocco and Romania. These are the two areas where significant change is required to make it easier for American business to start and maintain operations. America needs a streamlined approach to cutting red tape. First, all important business regulations should be subjected to cost-benefit analysis by an independent agency, as is done in Canada, the Netherlands and a half-dozen other OECD countries. The Congressional Budget Office is a possible candidate for this job. The results should be made public before a new rule is enacted by the Congress or local legislatures. Second, all cost-heavy regulations should come with sunset clauses, so that they expire after ten years unless Congress explicitly re-authorizes them. Australia is an excellent example of how sunset clauses have reduced bureaucracy and limited regulatory abuse. Above all, the US government should again embrace the ideal of free enterprise.